"Let's do lunch at Pho Tam sometime", suggested Big D while we were suiting up for Sunday night hockey. Although that sounded like a great idea since Pho Tam is probably the best in the GVRD, I wanted to try something new. I persuaded him to join me at a new Chinese restaurant in Whalley, not too far from Pho Tam. Now, Dim Sum and Surrey doesn't exactly roll off the tongue. Strange really, when you consider the large Asian population. So when I saw a place offering Dim Sum, it piqued my interest. 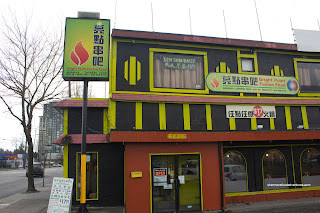 Located in the former City Central Palace, Bright Point Fusion is hard to miss with its bright lime green paint. MaryMac was curious as well and joined us for Dim Sum. In fact, Big D dragged 2 more people along which was a good thing, especially for Dim Sum. Entering the place, it seemed like the renovations were a combination of the old and the new with mismatch light fixtures and chairs. I'm pretty sure there was a great deal on lime paint as well somewhere... No matter, decor is one thing, but food is another. It was obvious this was a family run operation since we were greeted by the son who was taking care of a baby. We were presented with a menu and a sticky note pad to make our selections. At first, I was concerned that our order might be confusing since we were marking down numbers of the items as well as the number for the amount of each. In fact, it did end up confusing our server as one of our dishes was reversed (rather than 2 of item 1, we got 2 of item 2, not sure how that occurred though). 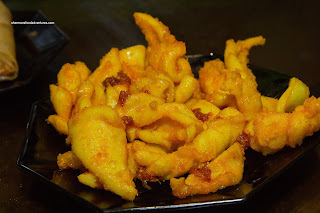 Anyways, we started with the Fried Squid and boy was it drenched in oil. We were one of the first customers there and I can only assume the oil wasn't hot enough yet. It was really too bad since the squid had a nice flavour - good balance of saltiness and a touch of spice. Now onto what I would categorize as one of the worst things I've ever attempted to eat was the Seafood Salad Spring Roll. The name on the menu was misleading as it said "Seafood Spring Roll". Rather, it was a salad roll consisting of canned fruit, mayo and barely any seafood. The roll was a greasy, oil-logged mess. When we bit into it, the melted mayo leaked out. With only canned fruit in the middle, this was not appetizing at all. 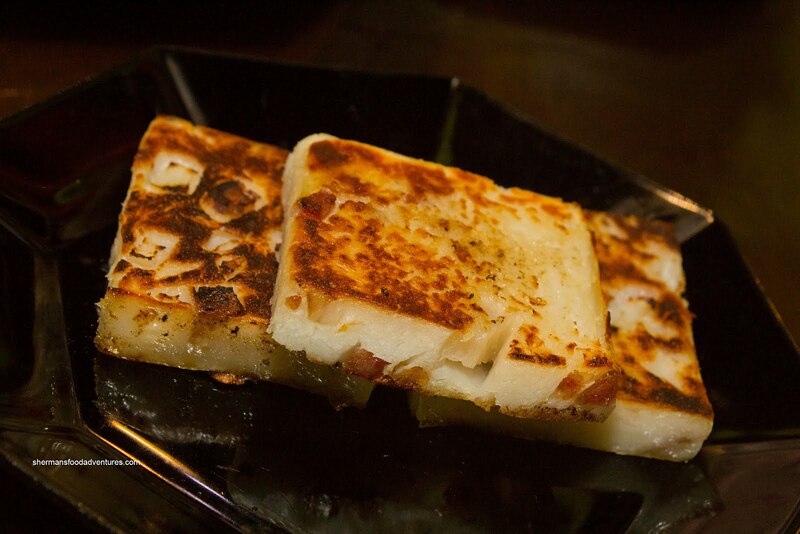 Thankfully, the Pan-Fried Daikon Radish Cake was decent. It was on the s tiffer side, but not terribly so. Good daikon flavour with intermittent pieces of Chinese sausage strewn throughout. It was fried up nicely and wasn't greasy at all. Now for the dish we didn't order but got 2 of - the Scallop Dumpling. These were alright I guess. 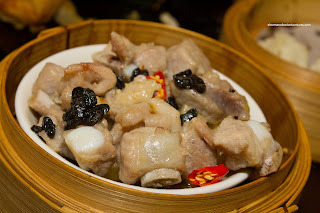 The filling was a mix of shrimp of pork which was topped off with scallop. 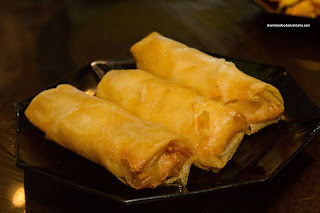 The texture of the filling was bouncy and decently seasoned while the rice flour wrapping was slightly dense. 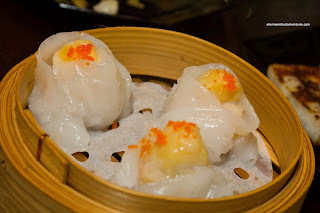 Probably one of the better items of the meal was the Sui Mai (shrimp & pork dumpling). I found the pork to have a good bounce texture which was easy to chew while not completely mushy either. The shrimp inside was okay, it could've had a better snap. Taste-wise, it was on the "porkier" side. Not that it was a bad thing though. Shanghainese joint that makes a decent one is Dinesty. So we were not expecting much out of the ones offered here. The skin was predictably thick and the amount of broth inside meager. However, I would say that it wasn't terrible. In fact, the meat filling was pretty acceptable and the flavour was pleasant. 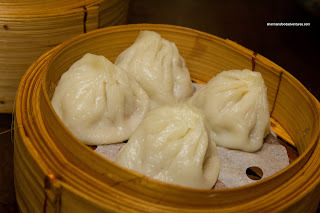 And of course I was not even attempting to compare it to an actual XLB from a Shanghainese restaurant. 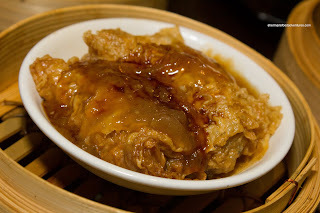 With an overly thick oyster-based sauce, the Bean Curd Skin Rolls, much like the other dishes, were okay. They were a bit scrawny with little in the way of pork filling. The textures were alright though. I didn't find the pork gritty nor the bean curd skin too tough. The sauce, however, was a bit off-putting since it was goopy and actually slid off the roll itself. Lastly, we waited for our original order of Haw Gow, which was left off the bill due to the do-it-yourself-blank-sticky-note ordering system. I'm pretty sure they rushed the order because the centre of the shrimp filling was slightly undercooked. I'm sorry but there is no other way to describe these other than they were not very good. The dumpling skin was doughy had no elasticity whatsoever. Furthermore, the shrimp filling was mushy with no snap, bounce or real texture. At the very least, it tasted okay though. Just to cover all the bases here, I do realize these were slightly undercooked, but the shrimp filling itself was lacking in whole pieces of shrimp which would explain the texture as well. Okay, I'm really torn on this one. First, the restaurant is run by a very friendly family which are only out there to make a living. So by totally trashing the place in this post would be rather tasteless. Furthermore, I really don't want to offend the person who tweeted me the recommendation. However, the bottom line is the food was pretty mediocre at best. Considering most of the dishes are only $2.75, it tempers one's expectations and makes it more acceptable. Also, the fact there is no real good Dim Sum around in the area might help its cause. Yet, for me personally, I'm probably not their target customer. Wow, another sketchy Surrey food visit! You truly are adventurous! I think the only good thing in that area is Tokachi? 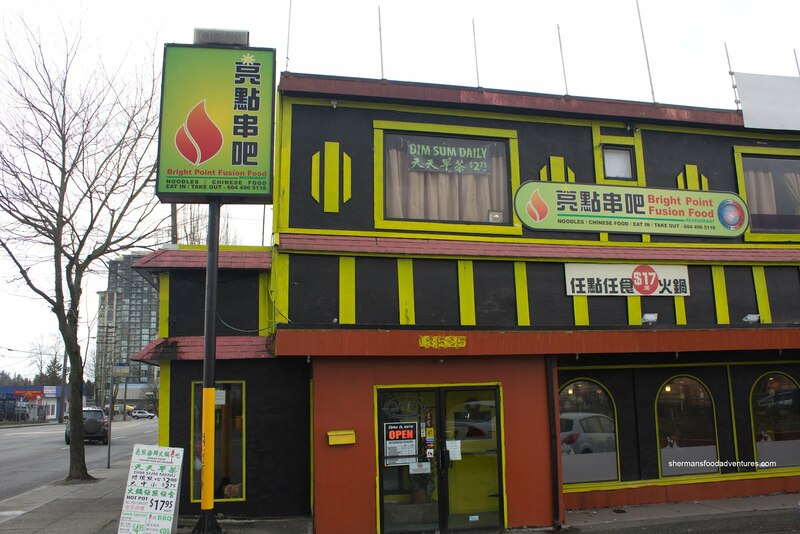 I often drive by this place to and from the Pattullo. Waiting at the light at King George and 108th can take a while, so I look over at this lime green place that changed names and I still don't dare to go in. Now I'm glad I didn't. 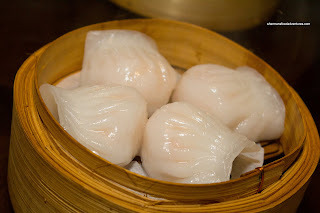 I'm a bit of a dim sum snob (please don't judge me...). @mbsunshine LOL, yah I eat everywhere... Tokachi is good, as with Pho Tam and Taqueria Jalisco. 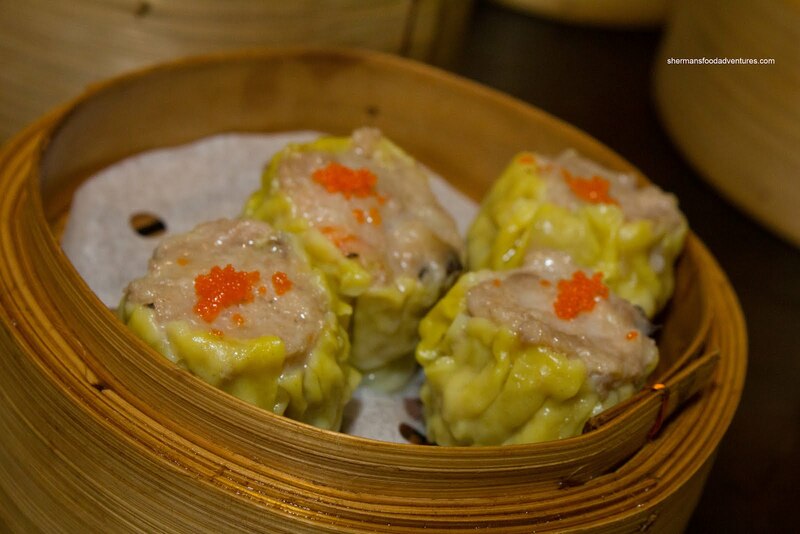 The Dim Sum was pretty mediocre to poor. And this is taking into account its location too. sherman, I emailed you about this place lol. Their dimsum is not their strong point but you REALLY need to try the dinner there to make a final judgement. Hideous decor aside , the dinner is comparable to many high end chinese restaurants. PLEASE re-visit! SHERMAN!! BIG MISTAKE TO TRY THEIR DIMSUM FIRST! This TRULY is a hidden gem for authentic chinese cuisine if you'd only tried it for dinner! Please re-visit I'm telling you the honest truth. Dinner is their strong point! @bosslady* Yah, sorry that it didn't do it for me (Dim Sum that is). However, yah I will try dinner sometime.